WD 4 Premium 13481530 https://www.kaercher.com/ie/home-garden/wet-and-dry-vacuum-cleaners/wd-4-premium-13481530.html The WD 4 Premium multi-purpose vacuum cleaner is powerful and robust while still being energy-efficient. It is perfect for cleaning up messes, and making light work of rubble and sawdust. Like all Kärcher products, our WD 4 Premium has been engineered with practicality in mind. The WD 4 Premium is one of the most versatile home and workshop tools that you’ll ever own – with its powerful 1000w motor, you’ll be able to clear up rubble, sawdust and spills, and even unblock your sink. The WD 4 is compact in size, and with its ergonomically designed carrying handle is light, mobile and easy to transport. The Kärcher WD 4 Premium comes equipped with a 2.2m suction hose, two suction tubes, a cartridge filter and a wet to dry floor tool, all of which can be stored safely on the machine. With the WD 4, you won’t have to change filters to clear up liquid messes, and the unique flat pleated filter system makes emptying the machine simple, with no contact with the filter or dirt required. The WD 4 Premium can be used to freshen up your garage, workshop, hobby room and cellars. With the wet/dry floor tool, it can also be used to clear your entrance areas and car interiors, as it is able to clear up small spillages of water. With its compact size and on-board tool storage, the tool can be easily tucked out of sight when not in use making it the ideal solution for any home. WD 4 Premium is rated 4.7 out of 5 by 27. Rated 3 out of 5 by Jinksh from Solid machine with ridiculously poor attachments The machine itself is great quality which is why the flimsiness of the main hose, tubing and attachments really lets it down. Why do this? After one session the main large end tube provided is showing significant wear and changing between large end tube and brush fitting is a nightmare if you need to do it frequently. It has really affected my satsfaction with using the machine. Is there any option to upgrade the fittings Karcher? Rated 5 out of 5 by metg from Fantastic The machine is pretty noisy but that's the only negative thing I can say about it. It works a treat. Rated 3 out of 5 by Marpator from Good hoover, but... I bought these hoover and is really good. In other hand, I did buy it on Kärcher website where it is said to give:-“2 Year Guarantee (+1 extra year when you buy direct from Kärcher)”. I did also registered the product on the website but I do not have feedback from Kärcher about the +1 extra year guaranteed. So I do not really know if my hoover got that extra year. Rated 5 out of 5 by Jonnyboy from Very pleased!!! What an excellent piece of kit. Bought it purely as a tool to valet the car but seeing what it can do I will use it in the house as well, its awesome. I also bought the car accesssory kit, well worth doing. 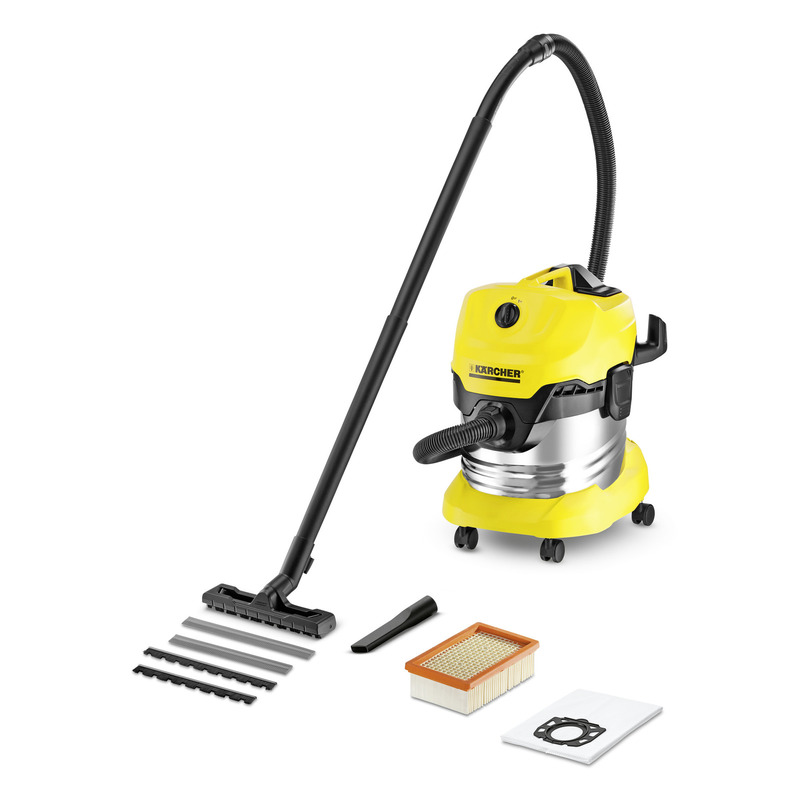 Great suction and its well made, just what you expect from Karcher. I also have the Karcher 7.710 Pressure Washer so I now have everything covered when it comes to car detailing. Rated 5 out of 5 by John I from Best vac for dirty jobs I bought this product because daughter renovating old cottage. Ceilings taken done with 100 years of dirt including lathe and plaster coated with soot and dust. Vacuum cleaner dealt with this massive task. Removed plaster from all external walls, vacuum again dealt with plaster dust etc. Cleaned out car after numerous trips to tip, much better than previous domestic vacuums.